Da Nang is a beautiful seaside destination that attracts many visitors from around the world. That’s why, especially in recent years, countless hotels, resorts, hostels, and homestays have sprung up in and around the city. 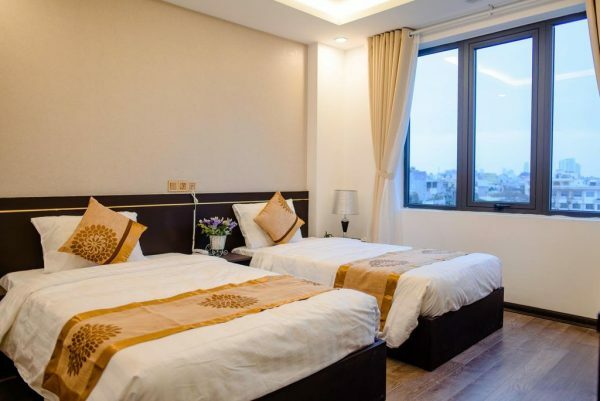 To make it a bit easier for you to find a place to stay that matches your budget and expectations and helps you make the most of your time in one of Vietnam’s most popular beach towns, we have put together a list of the best hotels, hostels, and other accommodations in Da Nang. Give it a read to find the perfect place for your traveling style and make your time in Vietnam even more fun and special. Da Nang being one of the country’s most popular seaside destinations, it’s hardly a surprise that there are countless accommodation options. From fancy hotels and resorts to budget hostels and cute homestays, the city offers a bit of everything. Which one is best for you depends on how you like to travel and how much you’d like to/can spend. If you are looking to chill out by a pool or on a private beach and want to take advantage of facilities like a gym and spa, a hotel or upscale resort is a great option for you. Alternatively, if you want to spend more time exploring the city and do some outdoor activities, a budget hotel or hostel might be better as you won’t be there much. Hostels are also great if you want to meet people to join your day trips or share travel stories with. Finally, homestays are a wonderful option if you are on a budget or simply would like to spend some quality time with locals. In Vietnam, many people rent out spare rooms to guests, giving you the chance to experience their way of life. Depending on the type of homestay, you might have the chance to share meals with your host or have them take you on a tour of their favorite places in and around the city. What better way to get to know a place and ditch the beaten track than on the back of your host’s motorbike? When booking a homestay, pay attention though. Since there are no standards or regulations, accommodation styles and quality vary widely from one place to the next. Some hosts might only rent out one room in their house to 1-3 travelers at a time. Others might have several rooms available, turning their homestay into a family-run bed and breakfast. Another tip: be aware that houses will probably be a lot more basic than hostels or hotels. Be mindful and respectful of that. 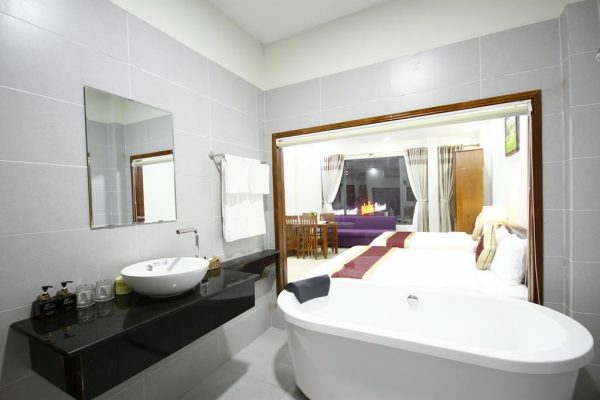 For example, rooms without A/C or small, shared bathrooms are not uncommon. This information is all available when you book though, so none of it should come as a surprise when you arrive. If there are some unexpected shortcomings in the place you booked, you can always cancel and find another one. That’s the advantage of a place like Da Nang, you have countless backup options. There are plenty of things to do in Da Nang to keep you busy for several days. From outdoor activities like hiking and exploring temples to bingeing on delicious seafood and other local specialties, there’s something for everyone. While there are plenty of places you can get to easily, be it by taxi or on a rented bike, popular destinations like the Hai Van Pass or a day-trip to Hoi An will take some more planning. To make sure it all goes smoothly and you can enjoy your trip, research any tours or transportation you use carefully. Read reviews on TripAdvisor or Facebook, check travel blogs, and talk to fellow explorers for recommendations. That way you’ll find out about genuine, established tour operators you can trust and large-scale tour resellers who are only after your money and not interested in providing a meaningful experience. Remember that bigger is not always better. Especially the large companies often offer impersonal tours that are more geared toward volume rather than quality time spent. Just imagine being herded onto a bus with 30 other people or getting only a few minutes at a stunning viewpoint… Doesn’t sound like fun, does it? If you’re worried about the quality of your tour, Onetrip does offer a few individualized tours in Da Nang and they are worth checking out. In addition, getting from the airport to your place of stay is yet another thing to worry about while you’re traveling. There are many forms of transportation such as bus, taxi, or private car. If you would like to book a private car, arrange it in advance with a driver waiting for you at the airport: Muvv is for you. Muvv is a new social transportation platform integrated into Christina’s that makes travel that much easier. With just a few clicks, you can easily choose the date, time and even the size of the car and everything will be arranged by the Muvv team. Check out their website to book your own transfer. Looking for a place to spoil yourself, lounge around by the pool, and relax by the sea? Da Nang’s resorts offer all that and more… The only hard part is choosing one! 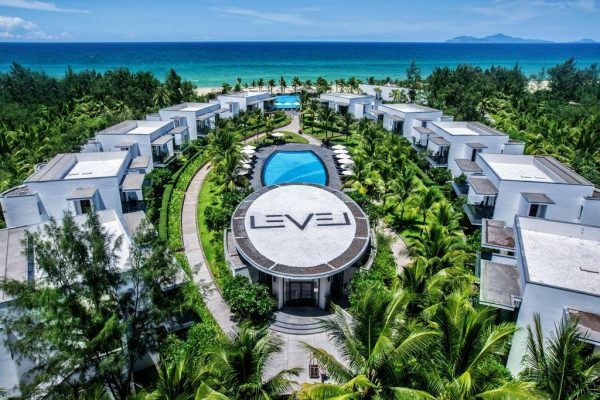 Rated as one of the resorts with the best value in Da Nang, the Melia is worth considering if you want to splurge on something special without breaking the bank. With direct access to a private stretch of Non Nuoc beach, it’s the dream of anyone looking for a serene place to relax while looking out at the sea and listening to the gently lapping waves. This hotel is also conveniently close to the airport (less than ten kilometers) and is walking distance from many restaurants and bars. If you’re keen on discovering the city but want a great place to come back to for downtime and maybe a massage at the spa, this resort could be for you. Located on a small island in the Han river, The Blossom is a wonderful choice if you’re a couple looking for a place to kick back after a long day of exploring. 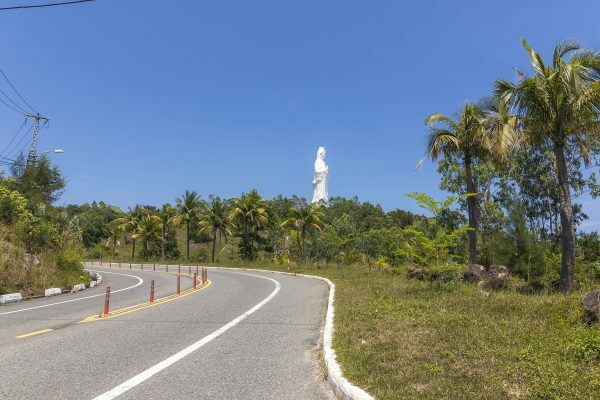 The resort is set in a quieter part of town and offers guests a chance to get away from the bustle of the city all while staying close to the main attractions, shops, restaurants, and bars. Couples in particular like this resort and its romantic rooms overlooking the gently moving river or the surrounding gardens. Book a room here if you want to get pampered at a luxurious spa and enjoy a tranquil nightcap on your room’s private terrace. Just a little outside of the city you’ll find Centara Sandy Beach, a resort with private access to Non Nuoc beach. This modern hotel is perfect for you if you want to spend time at the beach and test different water sports. Since the resort offers equipment for various activities, you can try something new like kitesurfing, jet-skiing, or anything else you feel like. After a long day at the beach, relax during a massage at the spa and let the staff spoil you at the open-air restaurant. Alternatively, take a walk around to find some seafood restaurants offering delicious fresh fish and crustaceans or other local favorites. Looking to stay somewhere close to the center for a reasonable price? 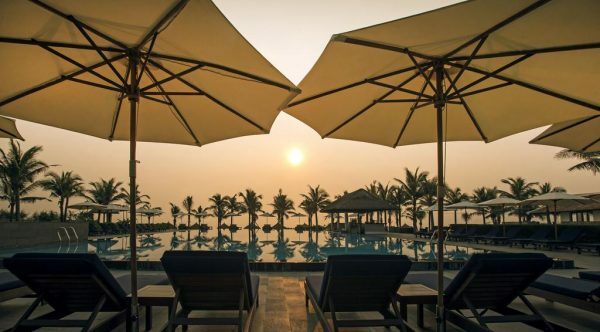 Da Nang has got you covered with a wide selection of great hotels and prices that will leave plenty of money left over for excursions, day trips or nights out. Right in the center of the city, even the architecture stands out. 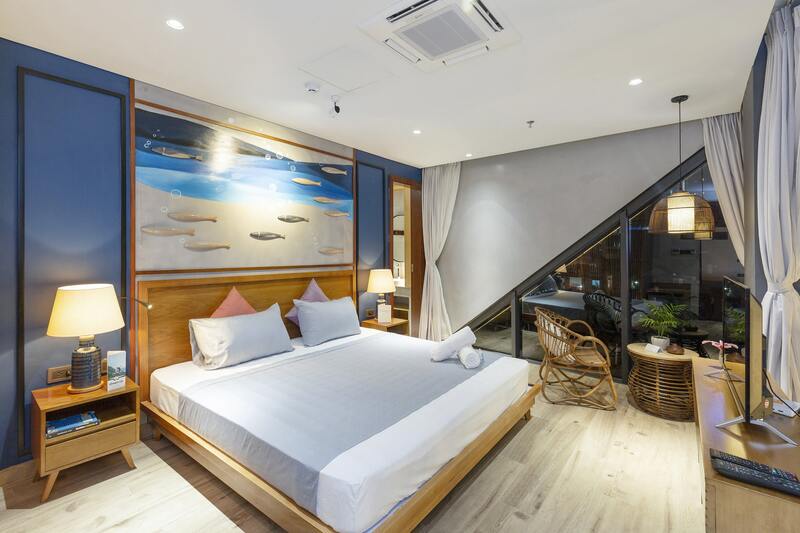 If you are looking for a modern-meets-Vietnamese hotel with great taste in design in a fabulous location, Christina’s Seahorse Da Nang will not disappoint you. Team Christina’s is always careful and mindful of the guest experience. The beautiful beds, the carefully placed wood accents, and the colorful flowers are arranged with 100% enthusiasm. I wouldn’t mind spending a night here. 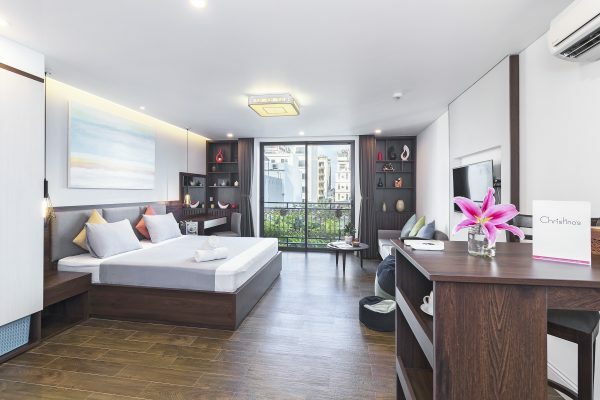 Christina’s Seahorse Da Nang offers dorms and private rooms with comfortable, modern, and fully equipped units. 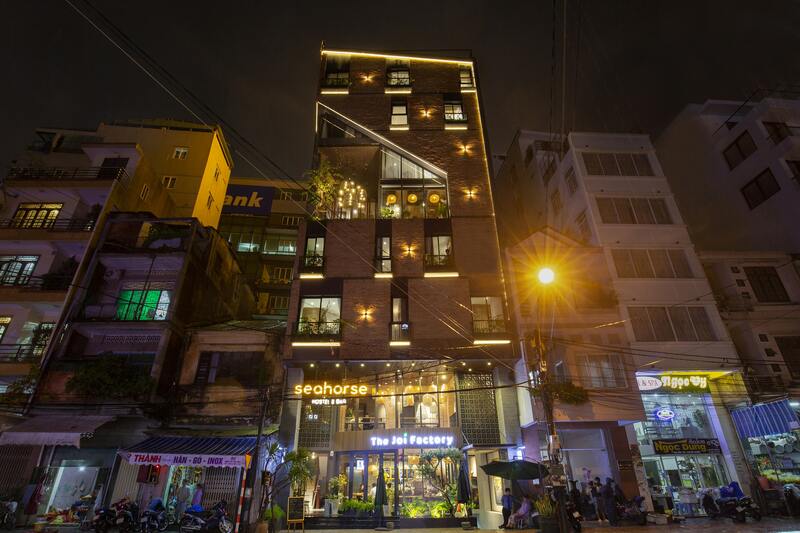 Located in the active city center, Christina’s Seahorse Da Nang is close to many tourist attractions in this pretty city like the Dragon Bridge and the Ham Market. We also have a nice bar and café, so you don’t have to go far for a chill night out or a morning cup of coffee. And the perfect place to relax or work downstairs! Or book at this link. A classy hotel just about seven minutes from the beach and about ten minutes from the city center, the Hanami Hotel offers excellent value for money. Modern rooms are available in various categories ranging from twin and king to family-friendly. 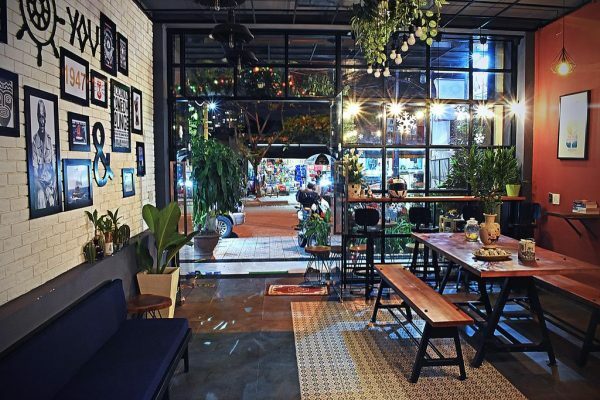 Stay here for quick access to Da Nang’s buzzing restaurant scene and venture out on the hotel’s free bicycle for a day of exploring and yummy seafood and other popular dishes. If you’re interested, the team at the Hanami will be happy to help you book tours or connect you to a motorbike rental so you can explore the area. A new hotel in Da Nang, the Brilliant Majestic is a fantastic place to stay if you want to be close to both the city center and the beach. While the name might suggest it’s a five-star luxury hotel, it offers great rates, especially since the rooms are new and the location is excellent. Love breakfast? Then book this place as it consistently receives high ratings for its food and beverage offering. And let’s face it, going out and exploring a new city is no fun on an empty stomach. This hotel also has an outdoor pool so if you didn’t get enough swimming in at the beach, you can catch up once you get here. About ten minutes from the beach and the city center Lis Hotel, perfect if you need a simple base for your excursions. The team here is very dedicated to helping guests make the most of their stay in Da Nang by helping with tours and transportation. Too tired to go far or climb mountains? Then hop on the free bike provided by the hotel and explore the city, find a yummy restaurant, and enjoy the explosion of flavors that is local food. Interested in budget-friendly accommodation? You’re in luck because Da Nang has many hostels to choose from. With some of them close to the city center and others near the beach, you’ll surely find one that fits your plans. 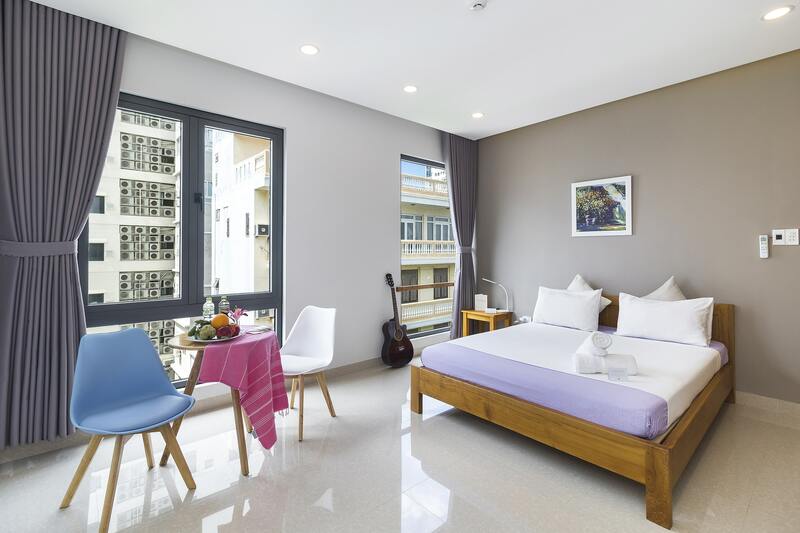 Just 500 meters away from the famous beach of Pham Van Dong, Pedersen Hostel will bring you a clean and comfortable getaway for an extremely affordable price. Here you are able to book dorm beds or private rooms that come with all the necessary amenities, and even more—free laundry, a great rooftop BBQ area, a library, and wonderful hosts. The hosts go the extra mile by not only ensuring that your stay is as comfortable as it gets, but they will recommend great spots to enjoy some local delicacies in the area and answer any questions you may have. You’ll really get to experience the world-class Vietnamese hospitality when you stay at Pedersen. Pedersen embraces the social concept of hospitality as is evident in the personal interactions between hosts and guests as well as the communal space in all properties. If you’re interested in booking, check out this link. Book Pedersen Hostel with Airbnb through these links: Full House, 10 Rooms, Standard Room, Superior Room, Front View Room, and Dorm. An attractive hostel right in the center of the expat district. The hostel has been built using giant, plain containers converted into comfortable living spaces, with a green area, decorated with plants and flowers for you to seamlessly blend in with nature. 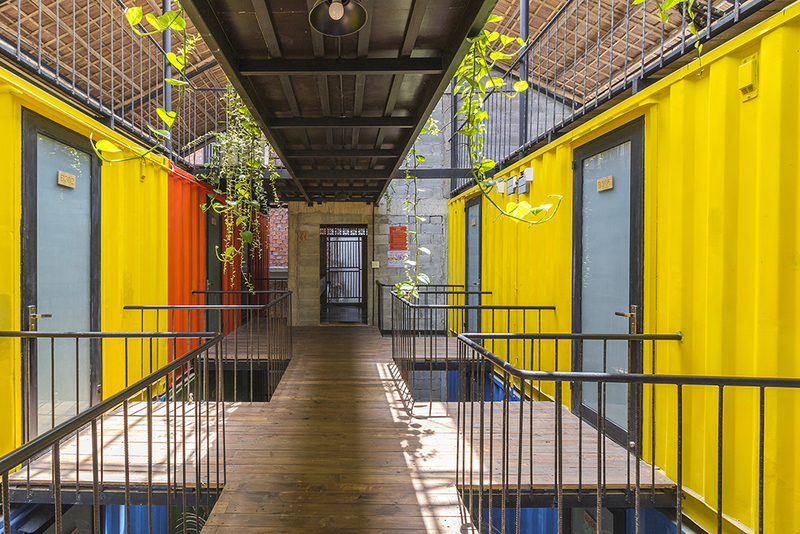 Setting itself apart from other hostels, Rom Casa is not only creative and unique, but it also creates a place of complete relaxation for guests. Wooden chairs dot around the cool swimming pool–even cooler during hot summer days. Understanding that you will need some time to catch up with work during your long vacation, so the owner has added a working space suitable for traveling digital nomads. That’s not all, head up to the rooftop and you will find hammocks! Claim one for yourself, grab your favorite book to read, a coffee from the cafe and spend your time swinging. When you’re done, head down to Rom Casa’s Bar & Cafe on the ground floor. Book Rom Casa with Airbnb through these links: Private room and Dorm. Feel refreshed by the bright walls! In the middle of the city, Otium Hostel is the perfect place to stay if you’re on a budget, enjoy sleeping in shared dorms and want friendly, personalized service. The hostel features several twelve-bed dorms, amenities such as towels and shower gel as well as Otium’s highlight – an open barbecue area. Gather around here for delicious dinners, games, and a chance to exchange travel stories with other backpackers. Who knows, maybe you’ll learn about some cool new places to go and can share your experiences of off-the-beaten-path adventures you’ve had in Da Nang. 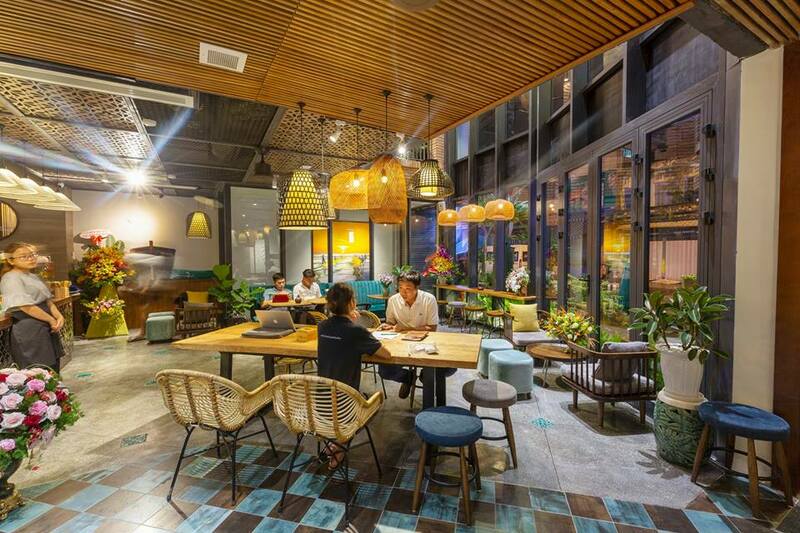 Book Otium Hostel Da Nang with Airbnb. A short drive from the airport, KonTiki Danang Hostel is only a few steps from the famous Dragon Bridge. This makes it easier for you to catch the times when the dragon spits fire! 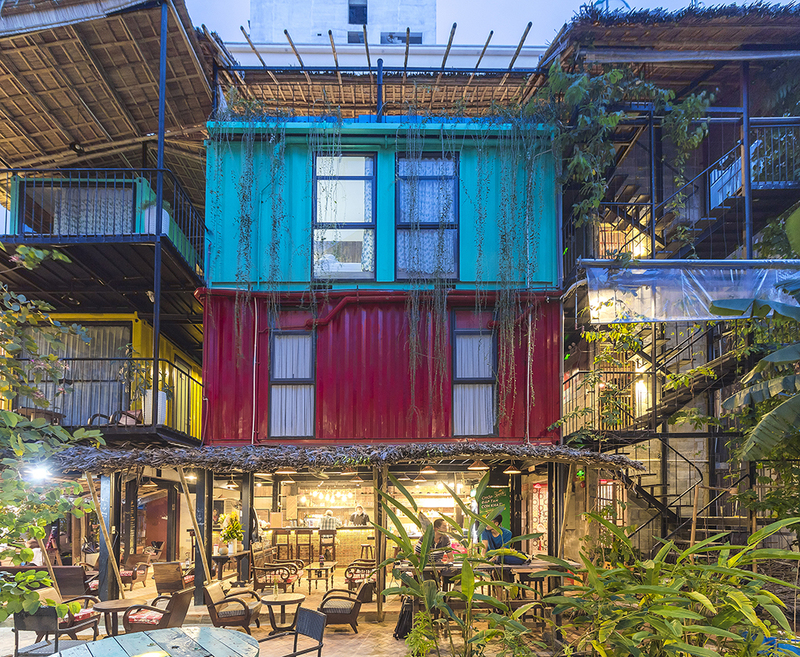 Apart from the location, the hostel is also popular among couples traveling on a budget as it features some simple, private rooms apart from its ten-bed dorm rooms. The staff at KonTiki are also super friendly and always ready to help you decide where to go next, what to explore if you’re only in town for a day or organize a ride for you to the airport or your next destination. If you want your stay to be an experience, the 4 Seasons Hostel is a great option for you. Apart from rooms with six to ten bunk beds, it provides modern clean facilities such as a terrace, a fully-equipped kitchen, and a common area. What makes this place special is that (for an additional cost) it offers a cooking class. Join in to learn how to make your favorite Vietnamese food and spend some time with the other guests. And of course, after the class, you get to enjoy the treats you made together with your new friends. What’s not to love about that? To make your time in Da Nang a special one, book a homestay with a local family. They can give you great insider tips on places to visit, restaurants to try, and other things you probably wouldn’t find out on your own. Just about ten minutes from the airport and equally close to some great restaurants, and bars, Homestay Halley welcomes guests for a unique experience. 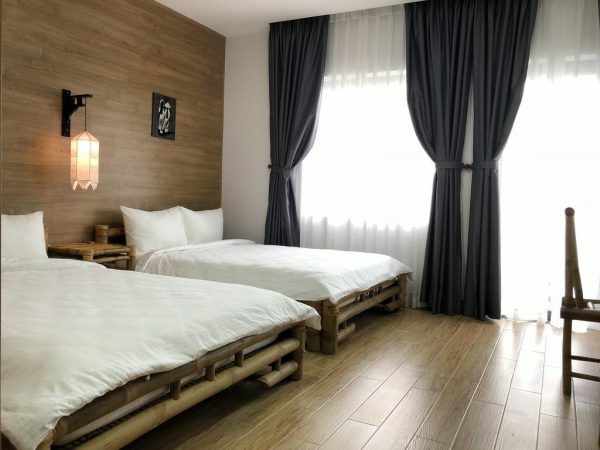 Run by a charming couple who shares their house, this homestay offers simple bedrooms and shared bathrooms, all highly rated for their comfort and cleanliness. The hosts are extremely friendly, helpful and sociable, making guests feel at home from the moment they arrive. If you love a good, homecooked breakfast before you start your day, you’ve come to the right spot! Here you can indulge in plenty of freshly made treats as well as a steaming cup of Vietnamese coffee in the morning. Could there be anything better to wake up to? Close to the beach as well as the city center, Homestay Sea Kite welcomes guests to spacious rooms with private bathrooms. This extra bit of luxury and privacy makes this one a bit fancier than other homestays. The experience here will be nothing short of amazing. Past guests rave about the hosts’ friendliness and their willingness to help with everything from booking tours, organizing transportation, giving restaurant recommendations, and even assisting with the occasional translation. The food here is also known to be great, so if you enjoy homecooked meals, put this place on your list. A bit outside the city, the Lucky Bee Homestay is a perfect homestay for groups of friends traveling together or families with kids. The family’s friendly pets are another plus and especially younger guests appreciate them. Apart from cozy rooms and yummy meals, the hosts offer a game room complete with a pool table, TV, and other entertainment options. Tired after a long day at the beach? This is the perfect place to relax and unwind especially because you don’t even have to go out to have a great time! 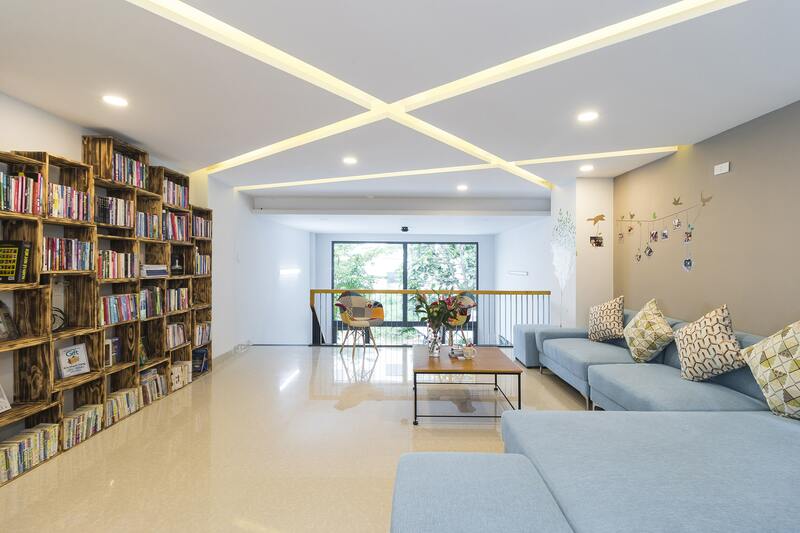 Book Lucky Bee Homestay with Airbnb. For travelers who want to make their own food and feel more independent, getting an apartment can be the best solution. Especially when you’re traveling with a small group of friends or your family, this is a great choice. Christina’s offers apartments and studios at three locations in the city. Whether you want to be two minutes from the beach or closer to Da Nang’s bustling center, there’s something for you. These modern flats all come tastefully furnished and with a well-equipped kitchen. This makes them ideal for both long- and short-term stays since they offer a kind of comfort and flexibility you won’t find at a hotel. On top of that, Christina’s wonderful team is always there to support you. Got questions about what to see and do in Da Nang? Do you want to find the best co-working space in the city to get some work done? Or are you looking for the best coffee in the city? They will be happy to help you find what you need to make your stay in Da Nang a success. Book Christina’s with Airbnb through these links: City Beach, Co-Living Apartments, and Riverside Studios. Only a short walk from the beach, these classy apartments are a good choice if you’re traveling with friends or family and want the convenience of your own kitchen while on the road. If you need to get some work done, Vivian Villa is great too as the rooms offer plenty of space to set up a temporary workstation. Having a lazy day? You don’t even need to go all the way to the beach for a swim since this place offers an outdoor pool. Once you’ve booked your stay here, let the staff know and they will send a shuttle to pick you up at the airport. Book Vivian Villa & Apartment through Airbnb. Da Nang and its surrounding area is a wonderful place to visit and discover. Its beautiful beaches and breathtaking scenery make it a favorite for many travelers. Now that you have an idea of where to stay, you can start planning the rest of your trip and make the most of your time in this seaside paradise. 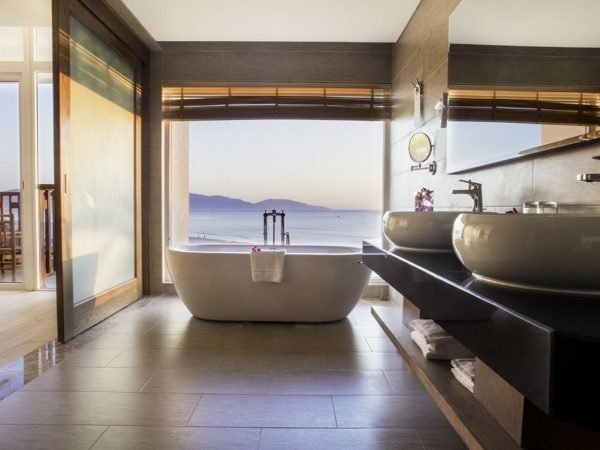 For more great ideas on what to do, check out our Guide to Outdoor Activities in Da Nang or find out about A Complete Guide to Seafood in Da Nang, or An Up-to-Date Guide on Spas and Massages in Da Nang.